Sarah Ferguson was close friends with Princess Diana. Source: Getty. 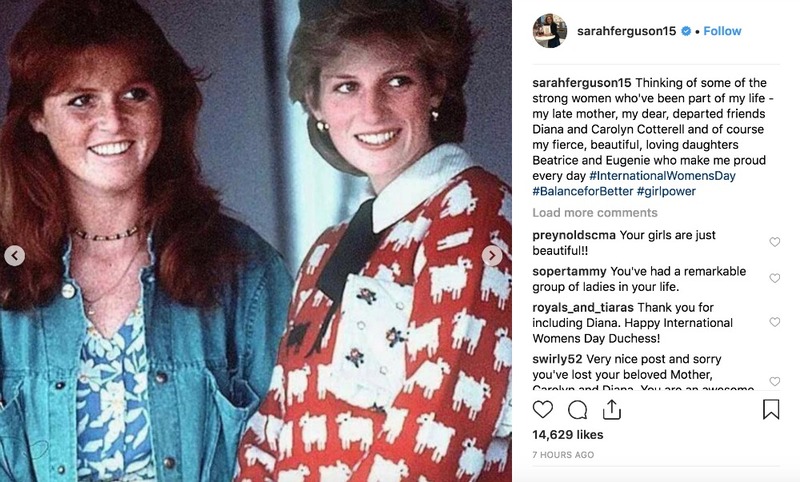 Sarah Ferguson has paid a moving tribute to her “dear friend” Princess Diana for International Women’s Day. The Duchess of York, 59, shared a series of photos of her daughters Princess Beatrice and Eugenie, her late mother and her late friend Carolyn Cotterell. But it was the colourful snap of her with Diana that really caught fans’ eyes, as the pair look happy and relaxed next to each other in some vibrant patterned outfits, while staring off to the side of the camera. Fergie shared a very colourful photo of the pair. Source: Instagram/Sarah Ferguson. It comes after the duchess slammed cruel online trolls in a heartfelt open letter, comparing comments pitting women against each other to the nasty rumours about her and Diana years ago. Writing for Hello! magazine, as part of their new #hellotokindness campaign, she hit out at the “extraordinarily abusive comments” on websites and social media – claiming the “bullying, sniping, bitching, appalling sexism, racism and homophobia” is getting out of hand. “Women, in particular, are constantly pitted against and compared with each other in a way that reminds me of how people tried to portray Diana and me all the time as rivals, which is something neither of us ever really felt,” she wrote. She has now urged social media platforms and news websites to stand up to trolls and work to stop the abuse circulating once and for all. “I believe that it’s time to take a stand. This isn’t about freedom of speech. The truth is, it’s not acceptable to post abuse or threats on social media or news sites, and it’s not acceptable to harangue other users simply because they disagree with you,” she added. What are your memories of Princess Diana? How did you celebrate International Women’s Day?